KCNA: "His mad acts prove rhetorically who is the very one that adds to fear of the American citizens concerned for security of…mainland." KCNA: "His unsolvable rashness is little short of jargon of a cruel ruffian, political rogue much upset by the DPRK's toughest offensive." KCNA: "Shortly ago…Trump let loose such rubbish that the past 'dialogue' with the DPRK proved ineffective but 'one thing will work'." KCNA: "Countries…desirous of…peace…should never tolerate the U.S. high-handed…practices…under the slogan of 'American first doctrine'." KCNA: "Such acts of the U.S. have become all the more expressive after Trump, whose belief is money, took office." KCNA: "This is the height of the extreme U.S.-style egoism…it does not mind sacrificing of the global…civilization for its own interests." KCNA: "Recently the U.S. decided to withdraw from UNESCO under the pretexts of its dues worth…millions of U.S. dollars it has not paid." H.R. McMaster says danger in communicating with Kim Jong Un is that he doesn’t understand how serious we are @POTUS has been clear on that. 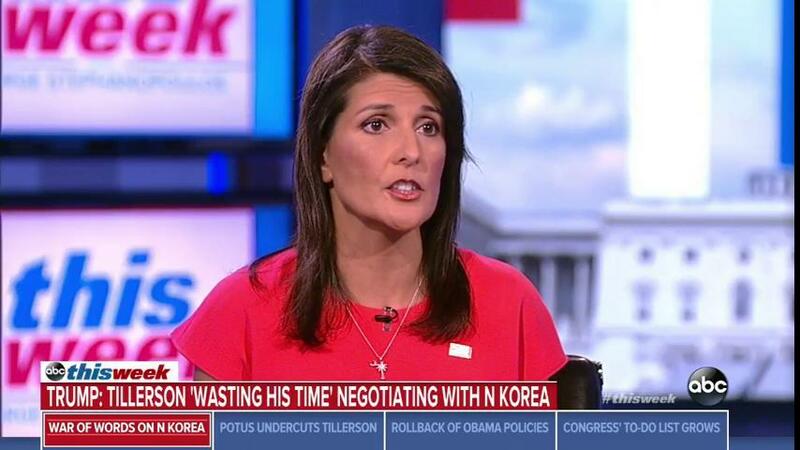 [email protected]: "If North Korea stops testing, there can be talks?" 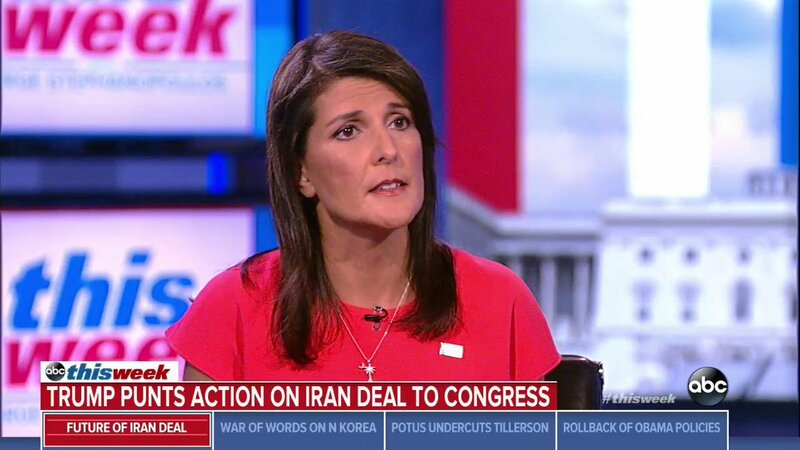 @nikkihaley: "Let's wait and see if they stop testing." [email protected] to @GStephaonopoulos: President Trump's decision on Iran deal "sends the perfect message to North Korea." H.R. McMaster on U.S.'s NoKo strategy: We must be ready all armed forces are getting to high degree of readiness for mission if necessary. H.R. McMaster on U.S. military strategy toward NoKo: @POTUS is focused on modernizing armed forces…military is getting stronger and stronger. H.R. McMaster says @POTUS won’t permit rogue government like NoKo to threaten the U.S. and will do anything necessary to prevent from happening. Tillerson on North Korea: "Those diplomatic efforts will continue until the first bomb drops." KCNA: "Nothing can break the…indomitable will of…the DPRK to surely achieve the goal of accomplishing the state nuclear force." KCNA: "They are seriously mistaken if they think they can find a way-out…currying favor with the U.S. and making sheep's eyes at the DPRK." KCNA: "This is contradictory and sheer sophism bereft of reason in the light of their literal meaning only." KCNA: "The south Korean authorities are peddling the theory of 'simultaneous development of sanctions and pressure and dialogue'." KCNA: "Australian government officials…are…allowing themselves to be exploited by Trump's selfish 'America First Policy'." KCNA: "Such military acts compel the DPRK to take military counteraction." KCNA: "The Trump team is trying to provoke the DPRK through such reckless military provocations as dispatch of B-1B…and nuclear carrier." KCNA: "From the historical point of view, the U.S. aggressors were doomed to be forlorn wandering spirits whenever they invaded Korea." 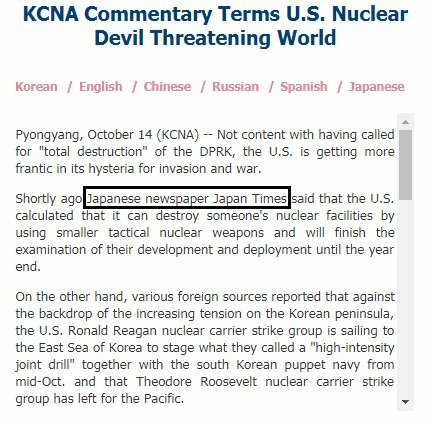 KCNA: "Trump's…hysterical military remarks made the situation…so dangerous that no one knows at what time a nuclear war will break out."